The Paradesi synagogue complex in Mattancherry's Jew Town comprises several different structures connected in various ways to the main worship hall. Many of these are not in active use. Once you enter the first inner room of the synagogue (thallam in Malayalam) - through a doorway in a wall connected to the clock tower - there is a small corridor leading to a rectangular room on the right. This was earlier intended and used as a store-room. Today, it is a gallery of emotionally valuable, framed canvasses dating to 1968, commissioned to mark the 400th anniversary of the building of the Paradesi synagogue. 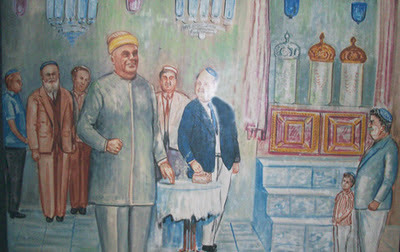 The then warden of the synagogue and unofficial 'Mudaliyar' (headman, a title which was first conferred by the Maharajah of Cochin and later abolished during British control) of the Paradesi community Sattu Koder asked a local artist S.S. Krishna to highlight the 2000 years of Jewish history in Kerala in ten paintings. During the anniversary celebrations, guests who saw the paintings included then Prime Minister Mrs. Indira Gandhi, and other dignitaries of the day - Governor of Kerala V. Viswanathan, Chief Minister E.M.S. Namboodiripad, his cabinet ministers, vice-chancellors and professors from various universities from India and abroad, diplomats, filmmakers and journalists. It was estimated that more than 100,000 people viewed the paintings and an exhibition of Cochin Jewish artifacts that were put on show. 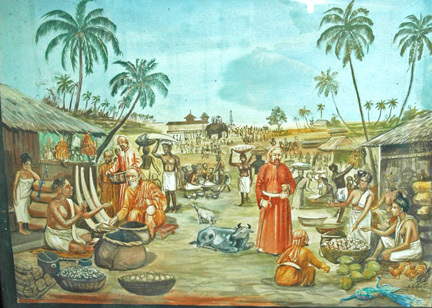 The first painting is of a typical Kerala marketplace (angadi) by the sea, obviously in Shingly (modern day Kodungalloor which was once known as Muziris, the entrepot of the world). 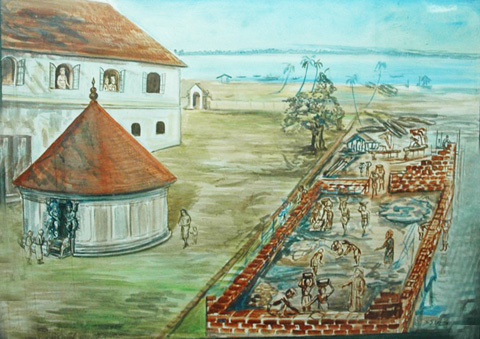 Shingly was the beloved and legendary ancestral home of the Cochin Jews. Goods being traded include spices, coconuts and ivory and the caption goes like this: "There was trade between King Solomon's Palestine 992-952 B.C.) and Malabar coast. 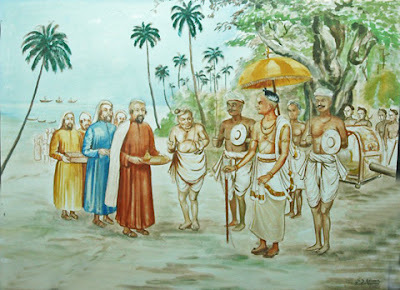 The Biblical name for India was 'Odhu (Hodu). Teak, ivory, spice and peacock were exported to Palestine." 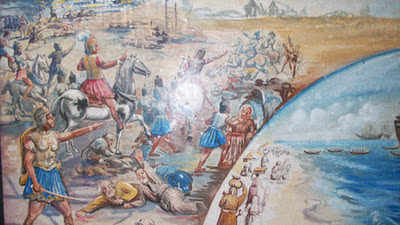 The caption for the second painting reads: "Destruction of the Second Temple in 70 AD by the Romans and the consequent dispersal of the Jews to the four corners of the earth from Palestine." The Second Temple was built by Herod the Great on the Temple Mount in Jerusalem - and soldiers are shown killing Jews with many fleeing in small boats. 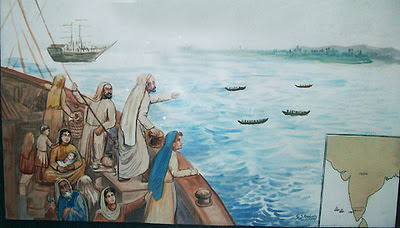 The third painting shows a ship with Jewish people on the deck, including a woman with a baby in her arms, sailing towards the Malabar coast. A small arrow points to a map of peninsular India and the port of Shingly with the caption stating: "Landing of the Jews at Shingly (Cranganore in 72 AD)". The fourth shows a Maharajah with his Nair retinue receiving the Jews. A palanquin and parasol (signs of privileges which the Jews also later received) can also be seen. 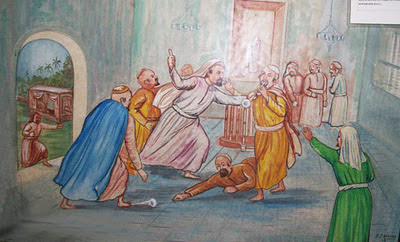 The caption reads: "The Rajah of Cranganore receives the Jews.."
Conflict is the theme of the sixth painting. "Two of the original silver trumpets, used in the Temple of Jerusalem, with the Ineffable Name carved on them, were brought to Cranganore and were blown by Levites on the eve of Sabbath. Once the Levites were late and the laity (non-Levites) usurped their privileges and in the resulting quarrel, the trumpets were unfortunately destroyed." There is no written or other evidence (except oral traditions) of these trumpets having come from Jerusalem and scholars think it could have been a quarrel between two groups of Jews seeking to establish superior credentials in Cranganore. The seventh painting shows the Maharajah of Cochin welcoming the Jewish refugees from Cranganore and allowing them to settle in Cochin. The caption reads: "Construction of Cochin Synagogue next to the Maharajah's palace and temple in 1568." The palace is now a museum. The eighth painting harkens back to the Shingly of 1524 and states: "Destruction of Cranganore by the Moors and Portuguese in 1524. Joseph Azar, the last Jewish Prince, swam to Cochin with his wife on his shoulders. 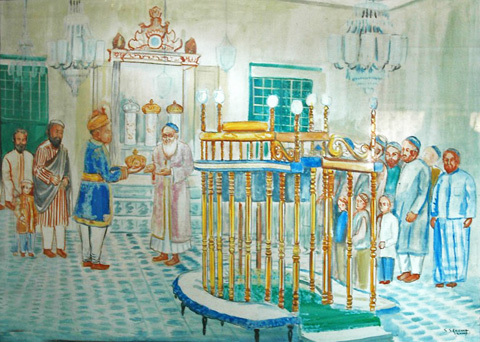 The Jews placed themselves under the protection of the Maharajah of Cochin." (The word Portuguese is mis-spelt as "Portugese" in the caption). 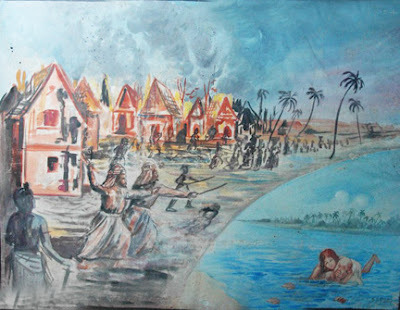 There are Jewish houses shown burning in the background as Joseph Azar is shown swimming in an 'inset'. 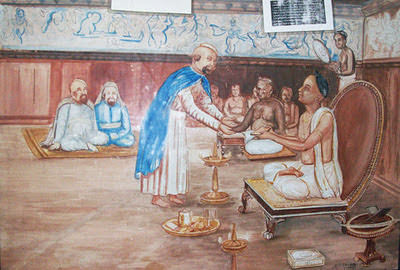 "The Maharajah of Travancore presenting a gold crown for the Torah in 1805" - says the caption for the ninth painting. The crown is made of 22 carat gold and encrusted with precious stones and today adorns one of the cylinders holding a Torah inside the Ark. (Other records say the crown was gifted in 1803 by Maharajah Avittom Thirunal Balarama Varma who also had Jews living in his kingdom - in the village of Paravur. Balarama Varma was only 21 years old at the time!). The tenth painting shows residents of Jew Town in the middle of the 20th century meeting with the Maharajah of Cochin His Highness Rama Varma Pareekshith Thampuran. "The last reigning Maharajah of Cochin addressing Jewish subjects in the synagogue before relinquishing his throne in 1949." It is poignant that today, there are more paintings hanging on these walls than there are Cochin Jews in Jew Town. © 2011, Bala Menon - All rights reserved. Please write to me if you want to reproduce the pictures. © Bala Menon. Simple theme. Theme images by bopshops. Powered by Blogger.